Single Gunshot Reportedly Ends Dramatic California Manhunt : The Two-Way As investigators work to determine whether the charred body inside a California mountain cabin is that of former Los Angeles police officer Christopher Jordan Dorner, dramatic reports are emerging about what authorities hope were the last hours of the massive manhunt for the accused killer. Police blocked roads Tuesday leading to the mountains near San Bernardino, Calif., where accused killer Christopher Dorner was thought to be hiding. We most recently updated the top of this post at 1:25 p.m. ET. While authorities have canceled the "tactical alert" that had been in place during the manhunt for accused killer Christopher Jordan Dorner, the case has not been closed because it's not absolutely certain that Dorner is dead, a Los Angeles Police Department spokesman just told reporters. So, Los Angeles police officers and their families who have been under protection while Dorner was on the run will continue to get that protection until his death has been confirmed. Dorner, who was fired from the Los Angeles Police Department in 2009, had threatened many current members of that department in an online manifesto. He's suspected of killing four people — two of them police officers — over the past 10 days. The crime spree — and Dorner's life — appeared to come to a fiery end Tuesday in the mountains near San Bernadino, as we reported earlier. Also Wednesday, as the Los Angeles Times reports, Mayor Antonio Villaraigosa said of the more than $1 million reward for information leading to Dorner's capture and arrest, "if someone's earned it, they'll get it." As investigators work to determine whether the charred body inside a California mountain cabin is that of former Los Angeles police officer Christopher Jordan Dorner, dramatic reports are emerging about the last hours of the massive manhunt for the accused killer. -- A key break in the search for the 33-year-old Dorner came Tuesday morning, when two maids entered a home in the Big Bear resort area and were confronted by a man who fit Dorner's description. The man tied them up and fled in a stolen vehicle, the Los Angeles Times reports. But one maid was able to free herself and call police. Soon after, the Times says, "a hulking African-American man" hijacked another vehicle — after allowing the driver to take a dog from the truck. The suspect soon encountered state Department of Fish and Wildlife officers, exchanging shots with them. -- "The stolen pickup ended up in a snowy ravine, a sniper rifle in the backseat, according to sheriff's dispatchers," California's Press-Enterprise reports. "It was found off Glass Road, a steep, winding paved street that drops into a canyon. The driver took off on foot, igniting smoke grenades as he fled, dispatchers reported. He barricaded himself inside a vacant, 1929 cabin on Seven Oaks Road. Countless rounds of gunfire between the suspect and police echoed off snowy hillsides in Seven Oaks, a small community of church retreats and fishing camps northeast of Angelus Oaks." And during the standoff, the gunman killed a sheriff's deputy. That brought the death toll associated with the more than week-long crime spree to at least four. Two were police officers. 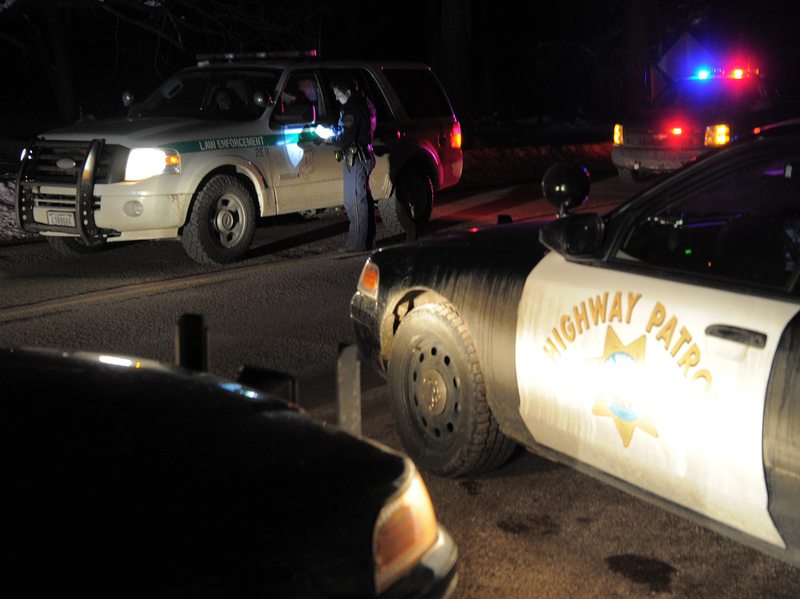 "The shootout in the San Bernardino Mountains capped a mammoth nine-day manhunt for Dorner that had Southern California police and residents fearful and on edge. He is charged in a Feb. 7 ambush that killed Riverside police officer Michael Crain, 34, who will be buried Wednesday. Crain and a trainee, who was severely wounded, were sitting in their patrol car when they were shot. Dorner also is suspected of killing an Irvine couple and injuring a Los Angeles policeman." It's thought that Dorner was taking some sort of revenge for his 2009 firing from the Los Angeles Police Department. The officer killed Tuesday was from the San Bernardino Sheriff's Department. Another officer from that department was seriously wounded. According to our colleagues at Southern California Public Radio, Los Angeles Police Cmdr. Andrew Smith said it could be days or weeks before the body found in the cabin is identified.